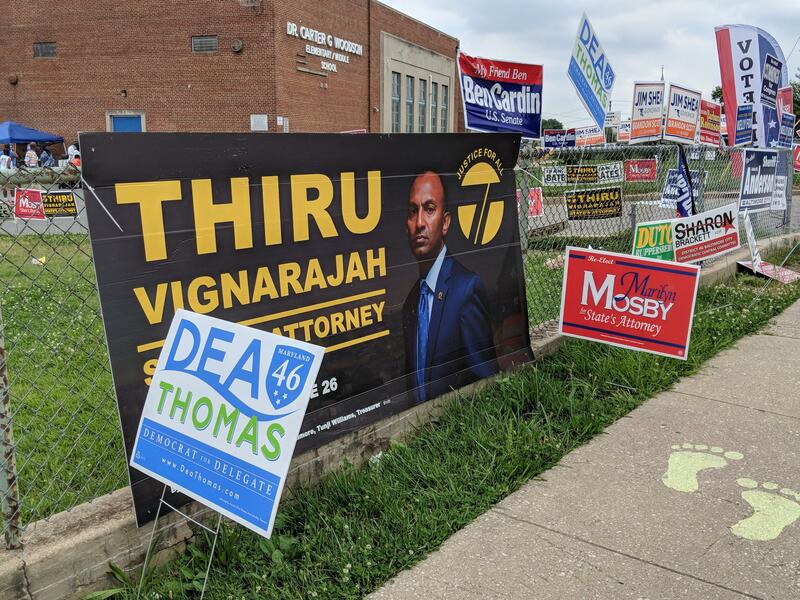 Campaign signs outside an early voting location in Baltimore's Cherry Hill neighborhood. Zeevelle Nottingham-Lemon, who lives in Edmondson Village, was among that 8 percent of Democrats. Speaking outside an early voting center in Downtown Baltimore Thursday, she said she wasn’t really excited about any of her options. Fells Point resident Robert Johnson, like many other voters, shared that lack of excitement about the governor’s race in particular. Pigtown residents Aaron Litz and Raquel Zuniga frantically poured over their sample ballot outside the polling place trying to decide who to vote for in the governor’s race. Litz said his first choice was former Montgomery County Council Member Valerie Ervin, but she dropped out of the race last week. He and Zuniga batted around names — in addition to Jealous, Prince George’s County Executive Rushern Baker and attorney Jim Shea were both options. “I’m very torn,” Zuniga said. She joked that Thursday was a test run, and that she might return to vote on Tuesday once she’s made up her mind. Litz went into the polls a few minutes later, while Zuniga continued to hem and haw before eventually following. Coppin Heights resident Tyeisha Blair was one of several people who said they had planned to vote for Baltimore County Executive Kevin Kamenetz before he died suddenly last month. She said she voted for Baker, despite lacking a strong preference for him over his opponents. Like many voters interviewed, she had stronger opinions on the race for Baltimore City State’s Attorney. She said she was excited to vote for Ivan Bates over incumbent Marilyn Mosby. Daniel Horton, of East Baltimore, said he was excited to vote for Mosby. “She’s the only one who actually took on the Baltimore City Police Department,” he said. West Baltimore resident Reginald Johnson agreed. “She got balls. I can’t find balls in Congress. I can’t find balls in most of my senators. Right? And here there’s a woman that has the temerity to do what’s right,” he said. The polls will be open on Tuesday from 7 a.m. until 8 p.m.
Get election coverage from the WYPR News team, On the Record and Midday. You can watch WYPR's live election coverage "Primary Night in Maryland" in this Facebook Live video. Go to the Maryland Board of Elections for the latest election results. We’ve interviewed the eight Democrats running for their party’s nomination to face off against incumbent Republican Gov. Larry Hogan in the fall and asked how each proposes to address the opioid overdose epidemic, and guns and public safety. With us to share perspective and insight is the Baltimore editor of the Afro newspaper, Sean Yoes. Ben Jealous has had the advantage in Maryland’s Democratic gubernatorial primary of having prominent national figures show up to stump for him. There were senators Bernie Sanders, Cory Booker and Kamala Harris as well as comedian Dave Chapelle. And he’s won the endorsements of liberal leaning national organizations, like SEIU and Friends of the Earth. Yet he styles himself as a guy who spent childhood summers with his grandmother in West Baltimore.